GLL, the UK’s largest charitable, social enterprise and leisure operator has been supporting young sports people in Newcastle during 2018 through their funded athlete programme, the ‘GLL Sport Foundation’. As applications for the 2019 programme are opening soon, we’re taking a look back at some of the outstanding achievements from our North East 2018 recipients. Competitive para-swimmer Ellen Stephenson may only be 14, but she’s already achieved a host of international titles and medals to get her future career off to a fantastic start. Ellen, who has Mosaic Down Syndrome, competes in para-swimming and Down Syndrome Swimming. Living in Newcastle, she trains with the Newcastle Swim Team and is part of the Down Syndrome Swimming GB team. In July 2018 she travelled to Nova Scotia, Canada with the GB team and took part in the Down Syndrome World Championships. She won 7 golds and 1 silver and became the overall female Mosaic World Champion. She has also competed in National junior para-swimming championships where she was placed in the top 3 for her age group in a number of events and she will also be competing in the National para-swimming championships in Manchester this December. 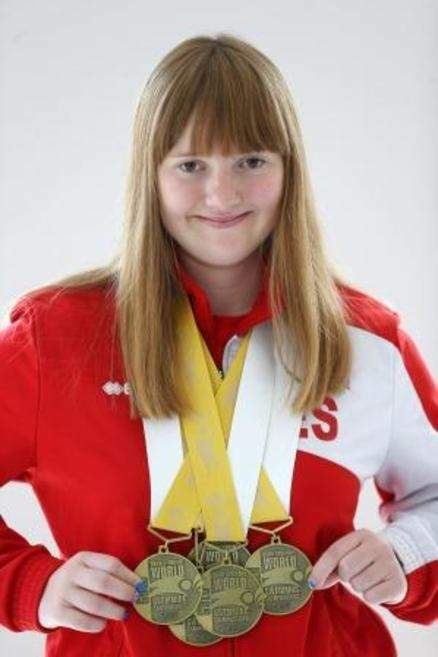 One of her biggest achievements in para-swimming was obtaining a time to compete in her first international competition in Sheffield back in June 2018 - The British International para-swimming meet. The GLL Sport Foundation is an athlete focussed programme providing athletes across the UK with tangible support to aid their sports performance, including training membership access to over three hundred venues across the UK, access to physio and injury rehab and financial awards up to the value of £1,250. These partnerships ensure that the Foundation can make the most impact to athletes that are transitioning from national to international level and with 74% of athletes being aged under twenty one and 87% of athletes receiving no other funding support, the impact of the Foundation is significant.